Is the CEO a liar ??? Is the CEO of IC Places, Inc. (formally IC Punch Media, Inc.) Mr. Steven Samblis a liar. Well… many say yes. Many point to his previous press releases where he promotes new relationships, affiliations, or initiatives that the company is involved with, and say because many, (and some say ALL), of these initiatives have not come to fruition (“true” as they say), that this is evidence of his lying. Well, we disagree. Many businesses initiate new ideas, try new things, enter into new relationships and affiliations. Many times these new initiatives turn out to be not what they initially thought they would be, and in some cases outright fail. That’s just business. Some things work… others don’t. So… simply because Mr. Samblis has tried new things to improve the company, and most if not all have not proved successful, and many have outright failed… does not mean he lied about them, or is a liar. However… what these poor and failed initiatives make him is… probably the worst businessman (and/or CEO) of all time. The club of businessmen and/or CEO’s that have spent tens of millions of dollars on trying new things, only to have their stock currently trade at extremely sub-penny status – AFTER 3 REVERSE SPLITS… is an extremely small club. A club some say Mr. Steven Samblis should not only be a member of, but be the leader of. What folks should be looking at to draw a conclusion that Mr. Samblis is likely a liar is hard evidence. Evidence that can be documented and indisputable against the common standard of proof. Lets look at some one at a time. 1) CEO Employment contract: Mr. Samblis files multiple 10-Q/K reports that state… “The company does not have employment contracts with its majority shareholder, who is the executive officer.“. This is a quote from the August 12, 2011 Quarterly report filing here. Then…the public filing dated 11/14/2012 states the following: “On November 18, 2005 the Company entered into an employment agreement with Steven Samblis to be our Chief Executive Officer.”. The passage goes on to list the compensation which includes the provision of majority control being maintained. Then… it becomes known that there was in fact litigation that had occurred during these 2 filing periods. See details here. Then… just recently the resignation letter of the president became available. See it here. Clearly, this was a voluntary resignation on the part of the president, which is, in direct opposition to Mr. Samblis’s SEC filing statements, as well as multiple message board posts. In fact, of late, Mr. Samblis is still maintaining that he requested the resignation. Additionally, notice the date of resignation discrepancy between Mr. Samblis’s statements and filings, and the actual resignation letter. Keep in mind that the above statements/declarations are from the formal SEC 10-Q reports, filed, signed, and attested to by the CEO of the company, Mr. Steven Samblis. 1) Reverse split: This one doesn’t even need any document references here. As everyone knows, there were a vast number of posts over multiple message boards where Mr. Samblis stated he would not do a reverse split of the stock. In several instances he used the word “never” in reference to the possibility of a reverse split. This was likely the topic that Mr. Samblis most addressed in his message board posts, and steadfastly disputed anyone that would even hint at him doing another reverse split. Then… as everyone knows, on March 27, 2013 he does a reverse split. Then… Friends posted the actual email exchanges between Mr. Samblis and Larry, which clearly demonstrate Mr. Samblis was not being truthful. (See them here.) as can be clearly seen, a) Larry did not contact Samblis to sell the sites… Mr. Samblis made the initial contact and requested a purchase… several times, before Larry agreed. And b) referring to the “hugely inflated price” as Mr. Samblis states… an agreed upon price of $1500.00 was struck. However, due to Mr. Samblis’s message board posting where he blatantly disrespected Larry… Larry cancelled the deal. Then Mr. Samblis later (October 27, 2013 email) offers over three times that amount, voluntarily, to purchase the sites, but that offer is refused (see the next email). 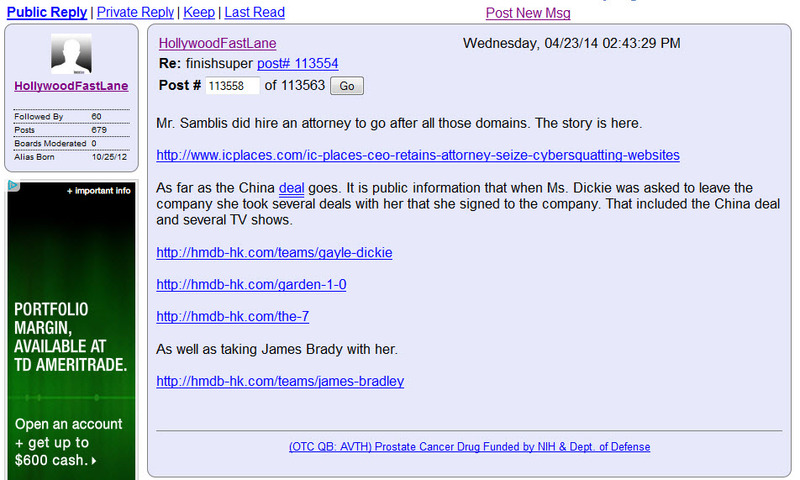 Clearly Mr. Samblis has misrepresented the actual events surrounding the purchase of our sites. Now, as most of you know, we could go on and on giving example after example of instances of where Mr. Samblis was, shall we say, reckless with the truth. Although some instances would be open for dispute, we think there are no better examples of questionable actions, that many would call lying, then the instances involving the SEC reporting. These SEC reporting discrepancies are clear, documented, and clearly a misrepresentation of the facts. Many would say a blatant disregard and disrespect for the authority of the SEC. Well folks… you have the facts, you are free to decide for yourself if Mr. Samblis is a liar. It seems obvious Mr. Samblis has recently taken to the message boards, using what many believe to be multiple aliases to promote the company, and therein a presumed purchase of the company stock shares (some call this stock manipulation). Many believe it is Mr. Samblis stating through multiple aliases that it is not him really posting using these multiple aliases. One such account, HollywoodFastLane, was apparently shut down recently by Investors Hub as being in violation of their Terms of Service, and many believe a fraudulent use of such account. Many say this is Mr. Samblis’s attempt at circumventing being held accountable for his statements and actions by claiming he was not actually the poster. The poster made multiple statements using the HollywoodFastLane account stating that he was “hired” by the company to maintain social media content. If this is actually Mr. Samblis making these posts, it is but another example of what many call lying. Maybe some day his use of such tactics may be able to be discovered and documented also. Fraud… or honest mistake – #3 ??? Well… here we go again folks. Friends has documented on 2 previous occasions, here and here, that there appeared to be significant discrepancies in what was reported on the IC Places, Inc. (formally IC Punch Media, Inc.) SEC quarterly and yearly company filings. Mr. Steven Samblis has yet to comment on these discrepancies. Well… here is a 3rd. such instance. As seen in the below graphic (click to enlarge), which is excerpted from the 10-Q report (here), it is clearly stated that Gayle Dickie’s resignation was “requested“. Keep in mind that this statement/declaration is from the formal SEC 10-Q report, filed, signed, and attested to by the CEO of the company, Mr. Steven Samblis. Also, in the below graphic, Mr. Samblis addresses the issue on his Facebook Page. This explanation has been since proven inaccurate, as Mr. Samblis was WELL aware of this legal issue prior to bringing her aboard. In other public posts Mr. Samblis considered the issue a non-issue, yet now he uses it as a convenient excuse when he thinks it serves his interest. Now, take a look at the actual resignation letter from Ms. Dickie (click to enlarge). Does this look like a letter from someone who was asked for their resignation? Also notice the date of the resignation letter, and then look at the date given in the 10-Q filing. See any dependency? 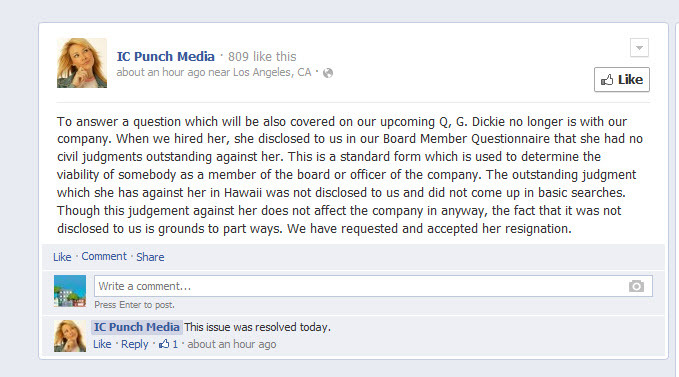 Ms. Dickie contacted Friends in order to set the record straight. In a lengthy conversation she indicated how frustrated she was with the misinformation and innuendos that were being published, such as on Investors Hub (see below graphic) regarding, and apparently insinuating, that upon her departure she “took several deals with her that she signed to the company“. As if to say, she took them illegally. As we understand the situation regarding “deals”, these shows were “Optioned” in order to allow time for funding of the production. These shows were optioned to Ms. Dickie and Mr. Bradley, not IC Places, Inc. or Mr. Samblis, therefore they were free to take them when they left the company. Now… this is prime example of WHY there should not be multiple posters using the same alias. Although the vast majority of reader’s are positive this is Mr. Samblis making these posts… he now has deniability for content such as is illustrated below because someone else has stated they were not Mr. Samblis making these posts under the HollywoodFastLane alias. Folks… as stated above, this makes 3 verifiable and indisputable instances of very troublesome discrepancies regarding statements and disclosures in IC Places, Inc. SEC filings. Many would say this is no coincidence, and appears to be a pattern. I think many would agree, these instances call into question ALL other statements, disclosures, and possible omissions within the SEC filings of this company, not to mention postings on message boards, be it using his own alias, or disguising himself as someone else to avoid accountability for his statements. Many investors ask about why there is seldom an SEC 8-K filing on new initiatives and company actions. With the trustworthiness of several of the past SEC filings as outlined in the posts referenced above… what difference would it make. Can investors really rely on what is stated in the IC Places, Inc. SEC filings? And of course we are not talking about discrepancies over minor items like perhaps misspellings, minor math errors, etc., no, we are talking about MAJOR issues like disclosures regarding the President of the company, lawsuits and judgements against the company, and CEO Employment contracts calling for large sums of company money and stock. Some would say Mr. Samblis is thumbing his nose at the SEC by apparently proactively manipulating material events to mislead, or flat out deceive the investing public, as well as the SEC, with the discrepancies contained in his company filings. If these reporting incidents concern you also, perhaps you should contact the SEC and file a complaint. The answers page about such is here, and the actual form to file an online complaint is here. As the below graphic indicates, the SEC is concerned about “False or misleading statements about a company (including false or misleading SEC reports or financial statements)”. Folks… as we indicated above, this was a lengthy conversation with both Ms. Dickie and Mr. Bradley, covering a multitude of topics. They are good people, true professionals in their field, with pristine reputations, and who were totally believable in their statements and comments. Can you blame anyone for resigning under the circumstances outlined in the resignation letter? Then, to add insult to injury, only to be told “I don’t owe you guys anything“… is just shameful and ungrateful. Most would agree, the resignation letter demonstrated true professionalism in light of the “I don’t owe you guys anything” statement Mr. Samblis made to them. Again, you have the facts, you can draw your own conclusion and opinion as to any wrongdoing here with regard to misrepresentations in the SEC filings, and then proceed accordingly. Fraud… or honest mistake ??? If you have seen the most recent SEC filing by the CEO of IC Places, Inc. Mr. Steven Samblis (formally IC Punch Media, Inc), you might have noticed a section making a statement about, have there been any legal proceedings. See graphic below (click to enlarge). As one could imagine, any legal proceedings the company is involve with are an important piece of information that should be included in the filings, so investors can be aware of any real or perceived risk the company may have as a result. Well… this most recent filing, the 10K (see here), as well as the previous filing, the 10Q (seen here) there is NO mention (or can be said, “disclosure”) that there is in fact a legal proceeding that, by all appearances should have been disclosed. Please refer to the graphic below (again, click to enlarge). 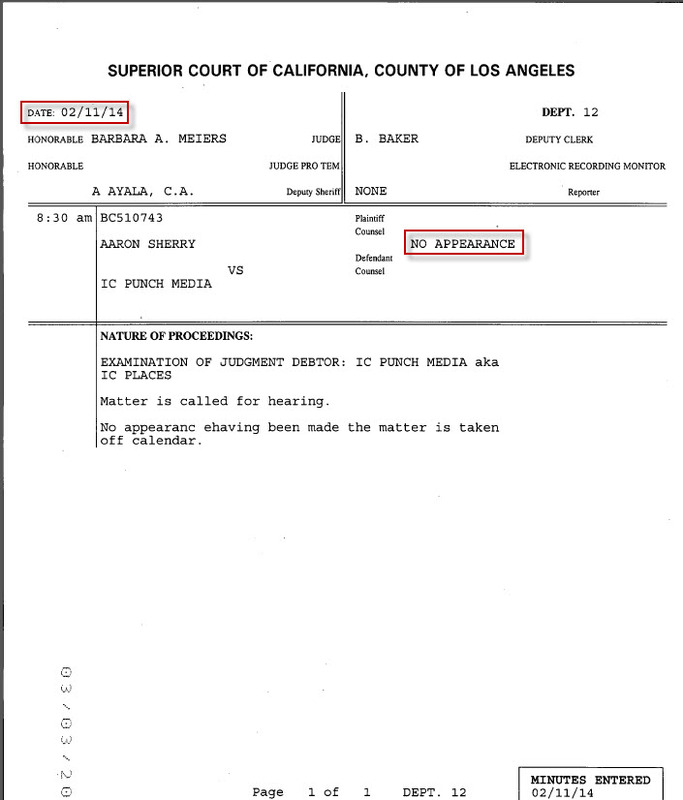 Notice the dates of both the commencement of the legal action, and the dates of the K/Q reporting periods. It’s public knowledge that the lawsuit was filed, and active when the SEC filings were submitted, so WHY was the legal action against the company not disclosed ? If interested, a complete listing of the initial complaint, and all subsequent documents can be obtained here. With the damages demanded ($75,000), that would have resulted in approximately 250 million shares of stock to satisfy payment. Many would agree this is significant, so significant as to certainly warrant inclusion (disclosure) in each filing where the action was still active. With approximately 16 documents having been filed with the court over a 6-month period, and at least $75,000. on the line, one would think it would be difficult to “forget” about the lawsuit, such that it would be overlooked when completing the SEC filings. Also, as evidenced in the below graphic, before an actual trial began there was an out of court settlement. 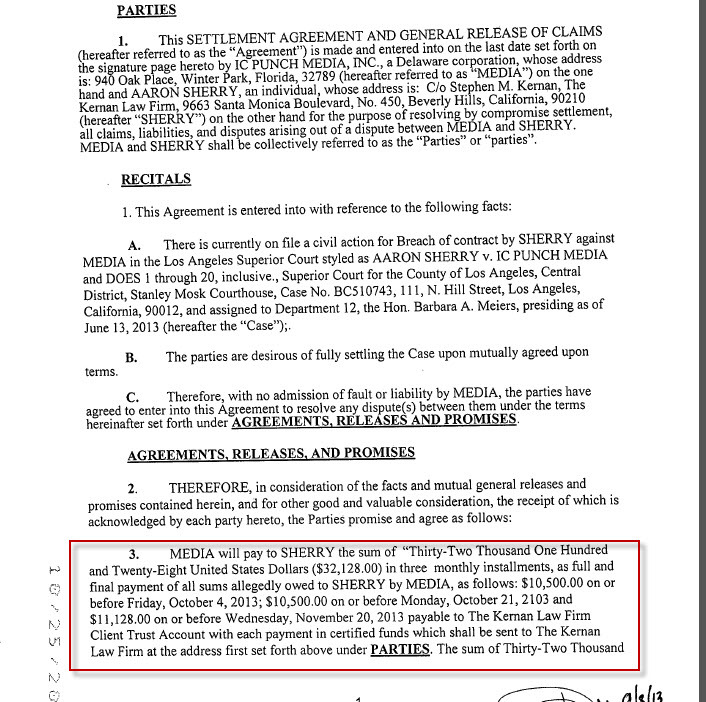 According to the documents, the settlement amount was $32,128.00, to be paid in 3 monthly installments. And as a condition of the settlement there was a provision in the settlement that provided for the event of a default (i.e. non-payment). In the event of a default, a Judgement would be entered IN THE FULL AMOUNT of sought damages (i.e. $75,000.). 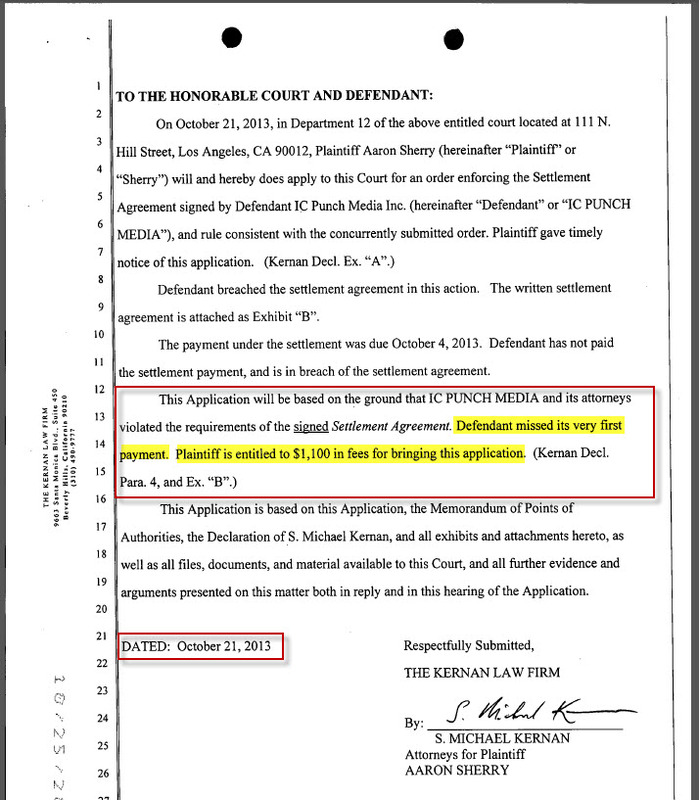 Well, guess what… Mr. Samblis did not make the very first payment, and, as the settlement terms allowed for, a Judgement for the full $75,000. was entered, AND… of course additional legal fees were requested as a result. See the graphic below. 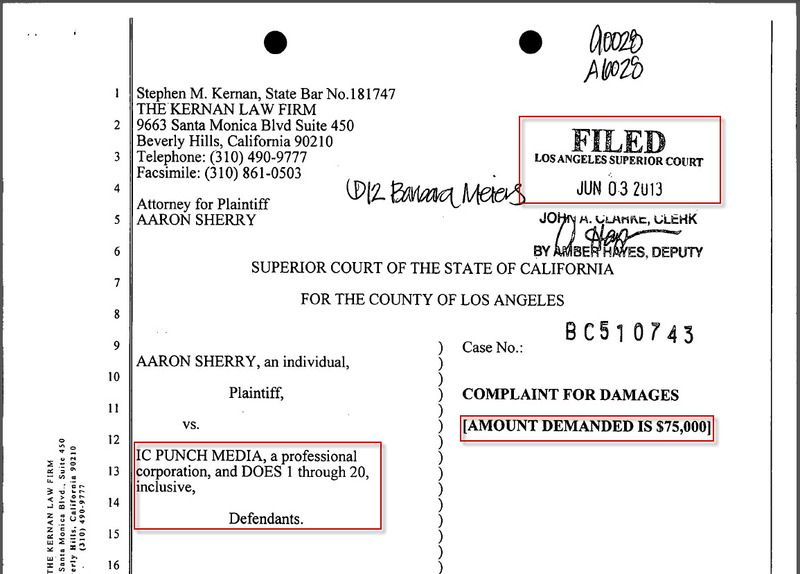 Where does the lawsuit stand today… unknown. There was a hearing scheduled for 2/14/2014 but as the below graphic indicates, there was a “No Appearance”. We don’t know WHO didn’t appear, or WHY they didn’t appear. We have attempted to contact Mr. Kernan but as of this posting date there has been no response. One could assume the debt is still outstanding, (if Mr. Samblis couldn’t make the first 10k payment, its unlikely he could come up with the 75k full default amount), however there is no confirmation of such at this time. One could also assume that if the debt had been satisfied, such a significant expenditure would need to be listed in the 10K document. However, there would be no need to assume anything if Mr. Samblis were to make a statement as to the status of the lawsuit. He could say: a) its paid, b) he could say its not paid and why… c) he could say its not my fault and blame it on the accountant, or d) and the most likely is… he could not say anything, and if he remains silent on the matter, that might give a good indication as to if its been paid yet. 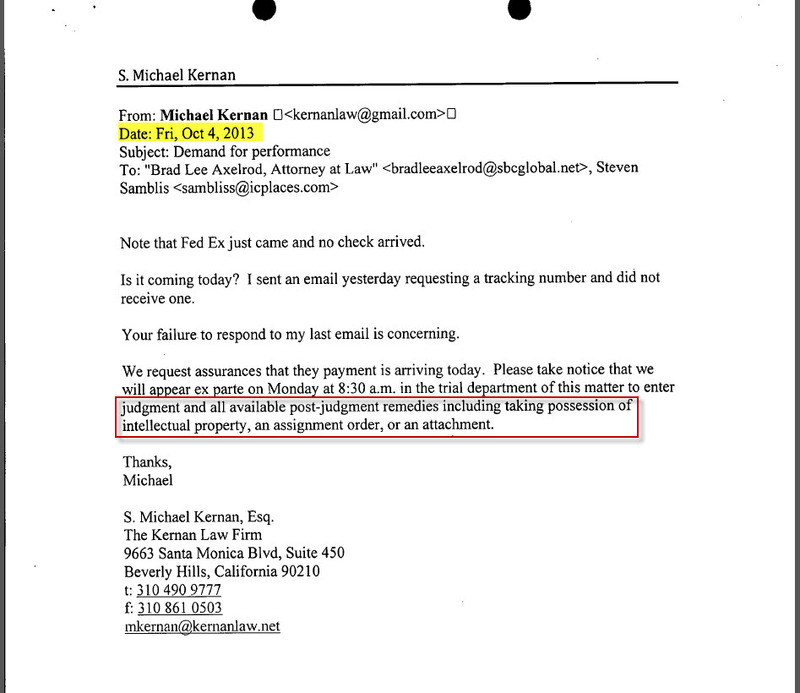 Also troubling, and may explain a lot about the whereabouts of content (2000 hours of video, etc) and other issues, such as the reasoning for the “Strategic Partnership” designation of MyImagineTV (instead of a wholly owned subsidiary of IC Places, Inc.), is the notification in one of the attorney’s letters seen below. Notice the highlighted section related to the “remedies” available, specifically “taking possession of intellectual property”. 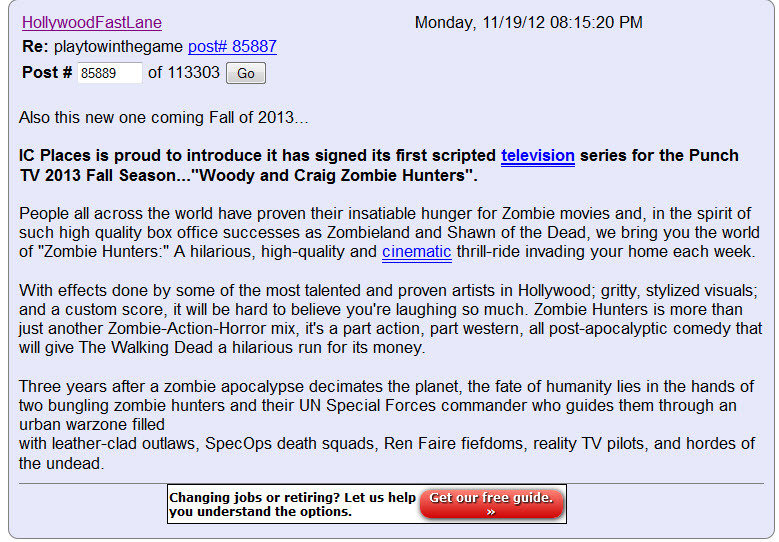 What was the lawsuit about… it had to do with the breach of terms and conditions set forth in a “Producer Agreement” regarding the production of the “Woody and Craig, Zombie Hunters”. See the quasi-press release in the below graphic. So folks… fraud, or an honest mistake? You have the facts, and you can form an opinion of your own. Additionally, it would seem appropriate for investors to ask… have there been any other misrepresentations in any of the previous SEC filings? 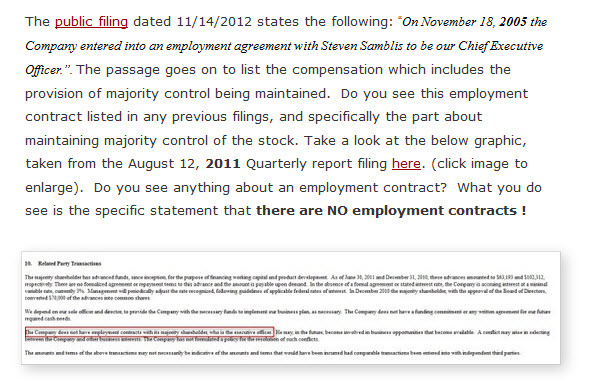 We know, as pointed out by Joseph Collins, that Mr. Samblis’s employment contract had not been listed in any previous filings prior to the dispute between them. The notification of the employment contract started appearing after the dispute. Below is an excerpt from one of our previous posts here, demonstrating there was apparently misrepresentation of Mr. Samblis’s Employment Contract. One would think that an employment contract with terms that paid the CEO 250 million shares of stock, and $250,000. as compensation, would be significant enough to disclose. Investors are led to believe that reports submitted to the SEC by reporting companies are accurate, and portray a valid and complete picture of the company listed. With examples like the above, one rightfully questions if investors can really count on the accuracy of such documents. 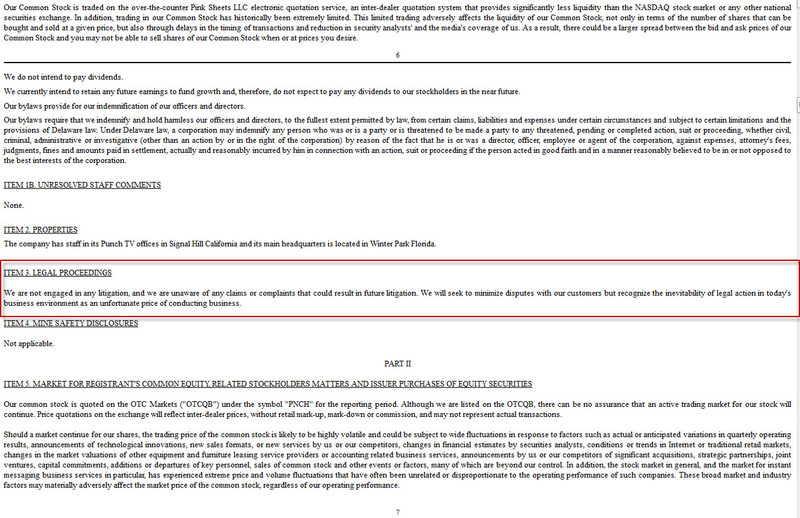 Can you really trust what you read in these SEC filings anymore ??? What else may have been “forgotten” ? The other indirect negative ramification of this breach of contract is… it would seem reasonable that other people in the network production/entertainment/talent end of the business may be hesitant to do business with Mr. Samblis now that he has a history of a breach of contract. This no doubt makes it more difficult to do business. 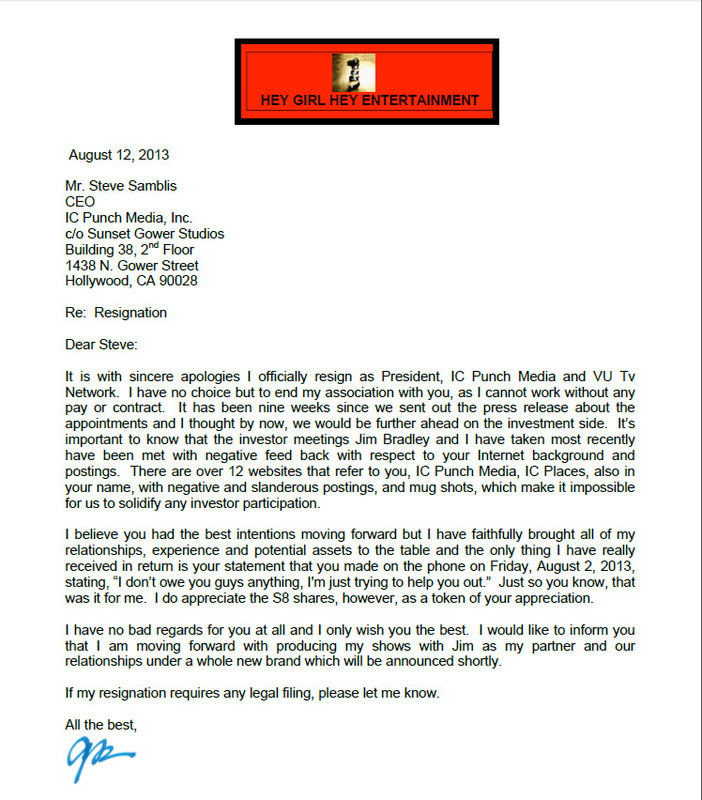 Well, finally, after some 8 days since the actual reverse split… Mr. Steven Samblis, CEO of IC Places, Inc (formally IC Punch Media, Inc) breaks his silence and speaks to the reason(s) he ordered the reverse split. See the post here. And in true Samblis form… the blame is redirected elsewhere. How many times have investors heard this? As we predicted in our post here, and again here, it appears the main reason Mr. Samblis cites for the reverse split is “Getting the company healthy is a major initiative. The reserve split was necessary to achieve this.” i.e. he did it all for the investors! If you are an investor do you feel special now??? Do you feel Mr. Samblis is looking out for YOUR best interest? Another reason Mr. Samblis cited for doing the reverse split is our websites ! Apparently he thinks our websites are one of the reasons the company is doing so poorly. Apparently Mr. Samblis thinks that if he can silence us, the company would do much better. He is probably right in that concept overall, however what he apparently fails to realize is that even if he is successful at silencing one of his critics, there will be more that pop up in our place. Does Mr. Samblis really think ALL his critics can be silenced? Bad decisions and the resulting opinion of such are going to be talked about publically nowadays… this is the internet age. Mr. Samblis appears to be exhibiting more of his arrogant and vindictive tendencies in singling out one particular critic over all the rest. Has he forgot about and ignored the loudest critic of all… LieHub? (which by the way, maybe we better change how we characterize them, after all they have been pretty good at accurately predicting the future with respect to Mr. Samblis) How about the scores of investors that have lost money on their investments in his company, which he then ridiculed and chastised on a public forum when they asked questions about his actions as CEO ? Mr. Samblis appears to be so delusional in his thinking that folks talking about the actions he has taken to bring the company to the point it is currently… is the reason the company is at the point it currently is. In other words… stop talking about all the bad decisions he has made because that’s what is causing him to make those bad decisions. This would be laughable if it weren’t so sad. Mr. Samblis needs to focus on making better decisions in order to move this company forward and overcome his past decisions that have brought this company to where it is today. Thinking he can silence people talking about his decisions is just a waste of ill-focused energy. Get a grip Mr. Samblis and start focusing on better decisions that will bring this company back from the edge of insolvency. He also states “After I refused to pay the outrageous money to the man that holds and runs these websites he turned them all into attack sites.” Well, re-read the above if you think they are “attack” sites, however if you want the real truth about what transpired regarding why Mr. Samblis does not currently own the sites he refers to, read the actual written exchange between Mr. Samblis and the owner of those sites here. You will also notice in this string of emails that Mr. Samblis OFFERED twice the previously agreed upon price for the purchase of those sites, and the owner rejected that offer and refused to sell the sites. So, once again, Mr. Samblis attempts to mislead the readers/investors into thinking what he wants you to think. Its a good thing there is a written record of the exchange or some readers just might be influenced by Mr. Samblis’s attempts to mislead. We thought this was an interesting post (click to enlarge) by a frequent poster on Investors Hangout about what another CEO did when his company did a reverse split. Its interesting to note the result of this CEO’s actions. We will leave it up to you to decide which appears to be the better decision made by the 2 CEO’s in question here.